When Pope Francis – the first Latin American pontiff – arrives in the U.S., he will find a Catholic public that increasingly has roots in Latin America, as Latinos now make up 34% of all American Catholic adults. But what may be less commonly known is the divide between Latino and white American Catholics on some church teachings. On a variety of issues – such as recognizing gay marriages and determining eligibility for Holy Communion – Latino Catholics tend to be more aligned with the church than are white Catholics, according to a new Pew Research Center survey. 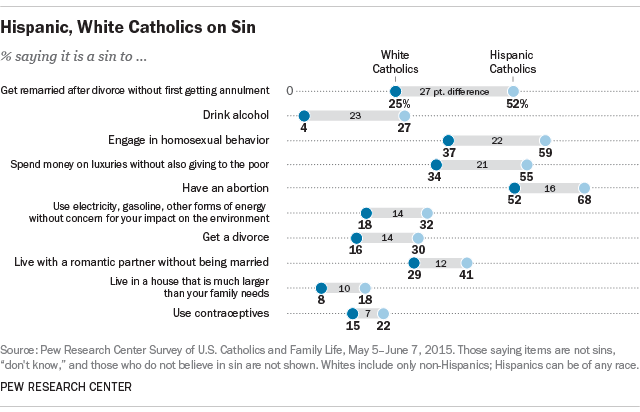 And Latino Catholics are more likely than white Catholics to view a variety of behaviors as sins. 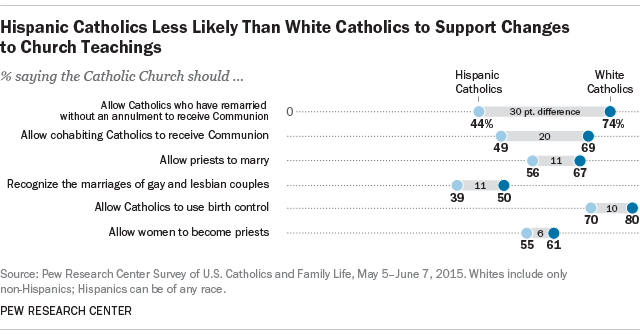 For example, while majorities of white Catholics believe the Catholic Church should allow those who are living with a romantic partner without being married (69%) or who have divorced and remarried without an annulment (74%) to receive Communion, roughly half of Latino Catholics say the same (49% and 44%, respectively). About half of Latino Catholics say it is a sin to get remarried after a divorce without first getting an annulment, compared with only a quarter of white Catholics who say this. And about four-in-ten Latino Catholics say it is a sin to live with a romantic partner without being married, compared with three-in-ten white Catholics. Homosexuality is another area where the two groups diverge. More white Catholics say homosexual behavior is not a sin (45%) than say it is (37%). But among Hispanic Catholics the balance of opinion is reversed, with roughly six-in-ten (59%) saying homosexual behavior is sinful and only a quarter saying it is not (25%). On gay marriage, too, a similar pattern is clear. While white Catholics are somewhat divided over whether the Catholic Church should recognize the marriages of gay and lesbian couples (50% say it should, 42% say it should not), Hispanic Catholics are less supportive of gay marriage being recognized by the church. Latino Catholics also are more closely aligned with the church than white Catholics when it comes to “sins of excess.” Roughly half of Latino Catholics (55%) say it is a sin to spend money on luxuries without also giving to the poor, compared with a third of white Catholics who say this (34%). Latino Catholics also are more likely than white Catholics to say it is sinful to live in a house that is much larger than your family needs (18% vs. 8%), and to use electricity, gasoline and other forms of energy without concern for one’s impact on the environment (32% vs. 18%). And while similar shares of Latino Catholics (62%) and white Catholics (61%) say working to help the poor and needy is an essential part of what being Catholic means to them personally, Latino Catholics are more likely to say working to address climate change is an essential part of their Catholic identity (40%, vs. 22% of white Catholics).